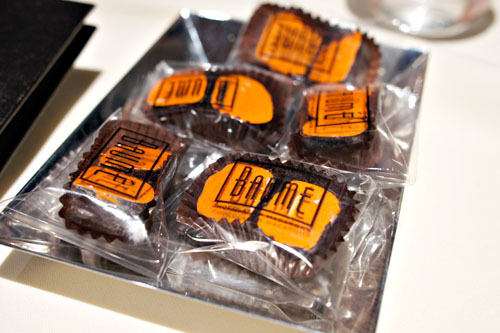 The third stop of our culinary tour of the Bay Area brought us down south to Palo Alto to sample Bruno Chemel's Baumé. Appropriately named after famed French chemist Antoine Baumé, the restaurant dishes up Asian-inflected contemporary French, tarted up by a healthy dash of avant garde flair. About the Chef: Born and raised in the commune of Moulins, France, Chemel grew up with foodie parents, and thus developed an interest in gastronomy at an early age. As such, he attended and excelled at a local cooking school, and during his tenure there, also worked at the Michelin two-star Jean-Pierre Billoux in Digoin. Wanting to learn more, Chemel earned a degree in pastry from the Culinary Institute LeNôtre in Paris, and then worked at a number of well-regarded restaurants such as Le Vivarois, Le Grand Vefour, and Guy Savoy. 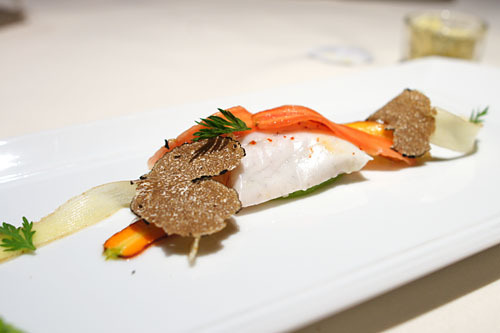 He even taught with the legendary Joël Robuchon at the Letna Institute in France. Chemel eventually moved to the States, landing an Executive Chef position at Le Chantilly in New York. From here, he relocated to Japan to learn the intricacies of macrobiotic cooking, and then became the head chef at Ambrosia in Tokyo's Keio Plaza Hotel (where I once enjoyed a wonderful sushi meal at Kyubey). 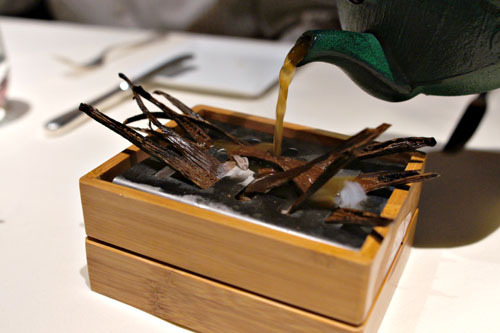 On his way back to the US, the Chef stopped over in Honolulu, Hawaii, where he opened his first solo project, Cliquo. In 2002, he transferred to Southern California to take over the kitchens of Michael Mina's Aqua at The St. Regis in Dana Point, which would eventually turn into Stonehill Tavern. 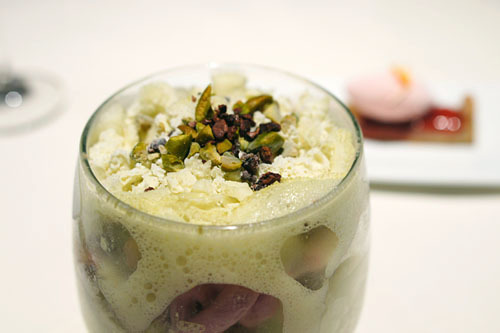 Two years later, Chemel moved to San Francisco and opened La Suite to considerable acclaim. 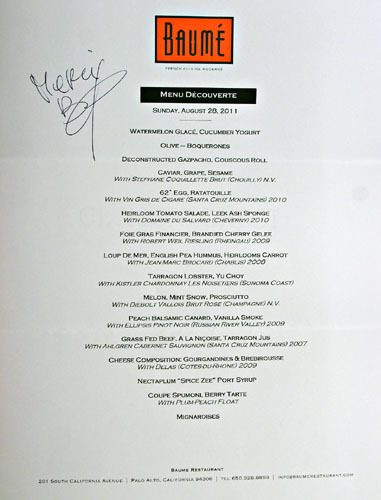 Then, in 2008, the Chef took on the Exec Chef position at Chez TJ, replacing none other than Meadowood's Chris Kostow. Things, however, did not go well in Mountain View. 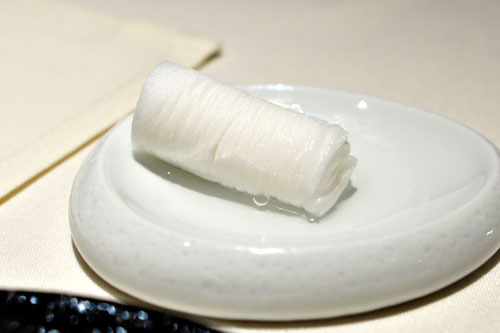 Chez TJ owner George Aviet publicly blasted Chemel for being incapable of attaining two Michelin stars (which, ironically, he just did), and as a result, the Chef, along with much of the kitchen (including Pastry Chef Ryan Shelton), left at the end of 2009. Chemel and company didn't waste any time, debuting Baumé in January the following year. Meanwhile, Scott Nishiyama took over the reins at Chez TJ, but failed to garner another macaron Michelin in the 2010 Red Guide. He was let go in February this year, replaced by Sous Chef Joey Elenterio. If history is any indicator, Elenterio might need to watch his back given that TJ failed, yet again, to score the deuce. Baumé's space is compact, seating only 22 diners. Enveloped in earthy shades of tawny, the room exudes a sense of vibrancy, though I'm not quite sure that it fits the food. Baumé's menu, interestingly, is governed largely by the principles of macrobiotic cooking, and thus is constructed with an eye toward proper digestion and moderation. Perhaps even more fascinating is the fact that there is no real menu at all, at least not in the traditional sense. Instead, diners are given a sheet listing the main ingredients that will be utilized, and instructed to point out any items that are off limits--the kitchen then works off of that. 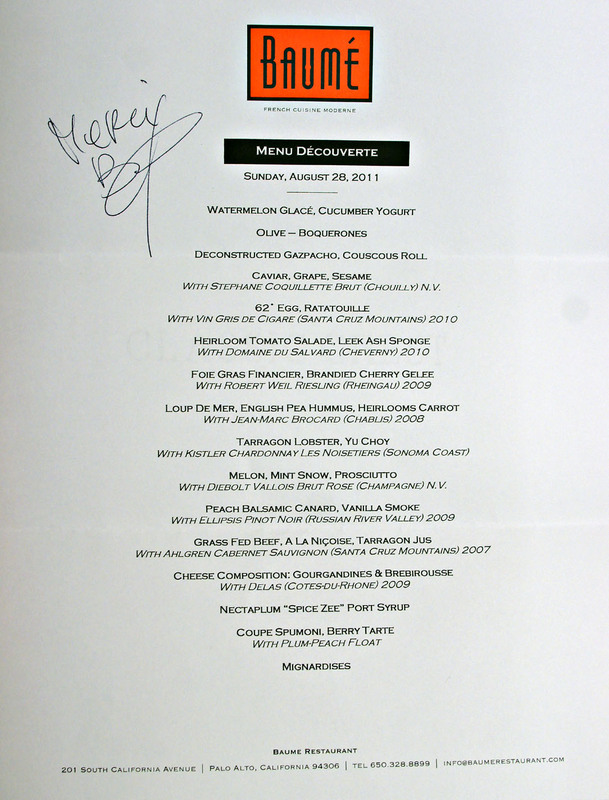 An eight-course Menu Gastronomique was offered at $128, plus $70 for wine (discontinued at the start of October), while we, naturally, went with the 12-course Menu Decouverte at $168 plus $90. Click for a larger version. While waiting for our table, we enjoyed a couple of cocktails. 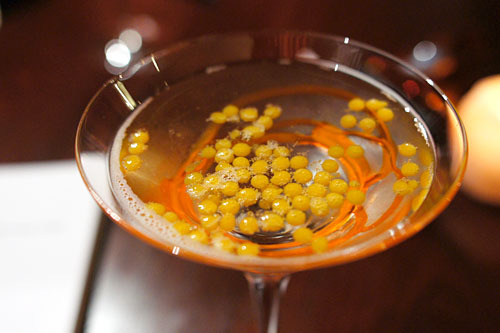 The signature Baumétini adroitly paired the sweetness of the sparkling sake with the juicy passion fruit spherifications. 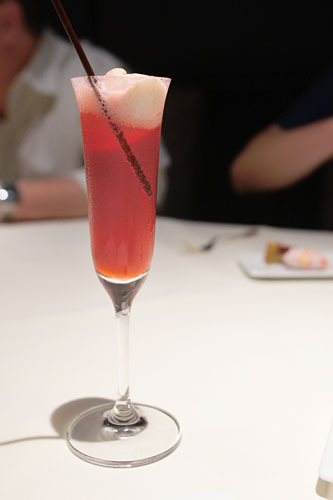 I preferred the Umétini, however, with its smart interplay between the nitro plum and the alcohol. We kicked things off with a bright, refreshing bite of juicy watermelon goodness, one finished with the cool relish of cucumber. Given that our next course required the use of our fingers, we were presented with some very interesting napkins: just add water. Next up was Chemel's riff on the tapas dish boquerones, featuring Spanish anchovy and nitro heirloom tomato and olive oil. I appreciated the interaction here between the olive oil and tomato, but really wanted to taste more from the fish and less from the bread. 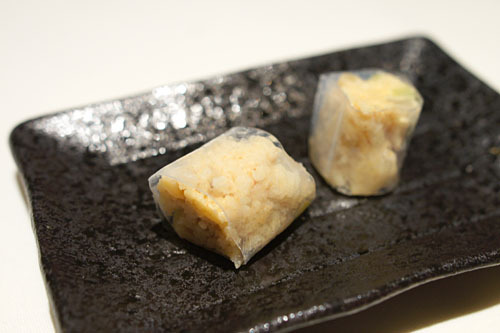 A "maki" was delightfully crunchy, with the essence of the couscous deftly displayed and played against a marked tanginess. 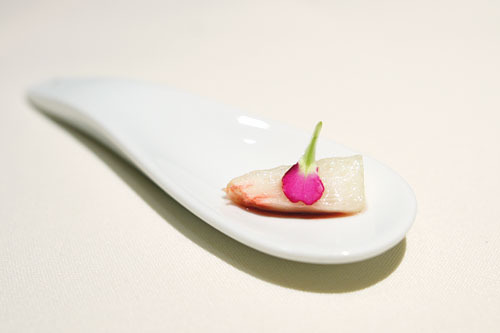 The gazpacho, meanwhile, showed off a tart sweetness balanced by a celery-tinged vegetal relish--think V8. 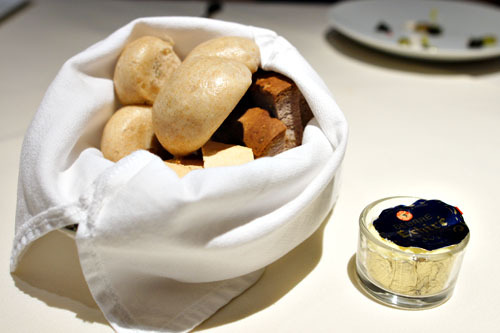 Bread consisted of three housemade varieties--honey lavender, levain, and walnut--all served with Échiré butter. Stephane Coquillette Brut (Chouilly) N.V.
A rather minimalist-looking plate comprised our first proper course of the evening. 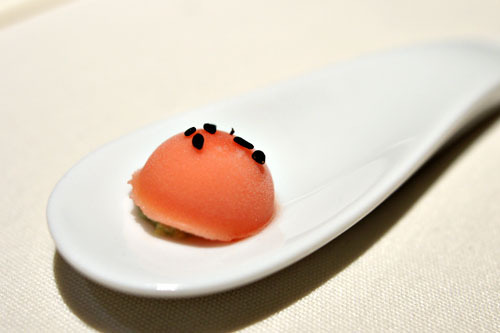 Though light on actual foodstuff, it was big on flavor, with a superb interplay between the saltiness of the caviar and the juicy sweetness of the grapes. At the same time, the sesame provided an overarching nuttiness to the fray, and I rather liked the slightly herb-y finish of the dish. It's hard to go too wrong with poached egg, and this was certainly no exception. 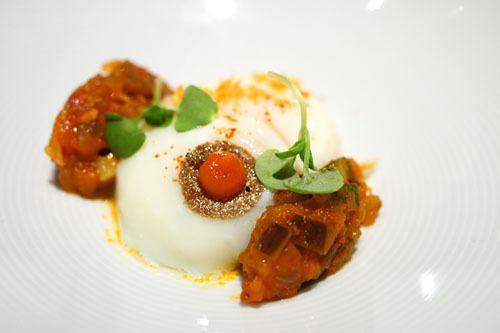 The egg was absolutely spot on--runny, luscious, and positively luxurious, with a keen creaminess that was deftly moderated by the vegetal tanginess of the ratatouille. Love salty finish too. This is one of the Chef's signature dishes, and I can see why. Here, I appreciated the sweet, juicy relish of the tomatoes, and how they played with the vanilla oil and tangy Balsamic gel. 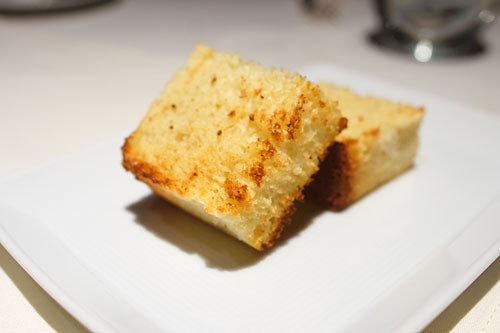 The leek ash, in both sponge and crumble form, added a focused bit of savoriness, but it could easily overwhelm the tomato--I had to be careful with it. 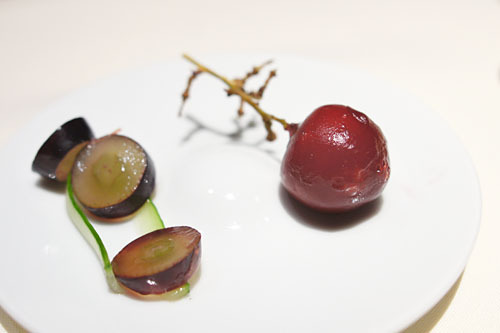 Here was Chemel's "Grape Déguisée," composed of foie gras mousse wrapped in cherry gelée. I loved the interplay between the pure, focused essence of the liver and the subtle sweetness of the cherry. 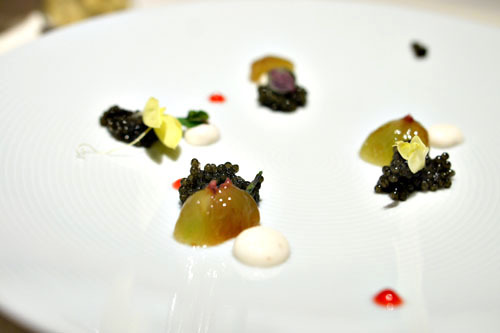 At the same time, the grapes served to lighten the dish. Very nice. European sea bass was tender, toothsome, and slightly flaky, with a mild flavor beautifully accented by the bright, vegetal tang of the pea hummus. 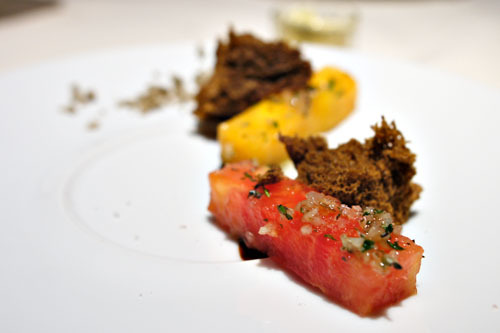 The carrots, meanwhile, added a crisp sweetness to the mix that I appreciated, though the summer truffle wasn't quite necessary. 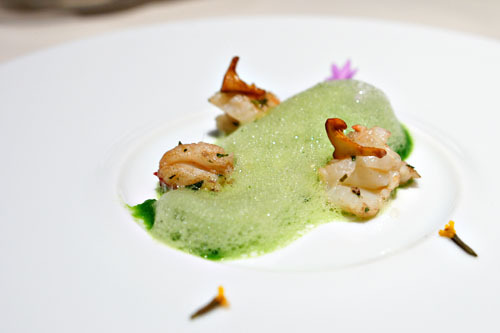 Lobster arrived expertly cooked to a snappy and supple consistency, with a soft, sweet salinity heightened by the earthiness of the chanterelles. I also enjoyed the strong, robust piquancy from the garlic flowers, but I had to be careful with the yu choy, which had a marked grassiness that could easily outshine the lobster. Diebolt Vallois Brut Rose (Champagne) N.V.
Next was a sort of intermezzo: the Chef's take on the classic pairing of prosciutto and melon. The melon's sweetness formed the base of the dish, joined by the saltiness of the ham, while the mint added a refreshing overtone to everything. 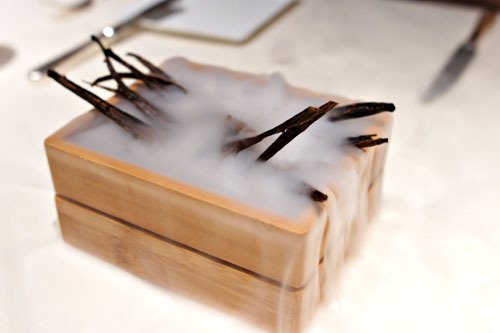 A veil of vanilla smoke set the stage for our next course. Very Alinea-esque. 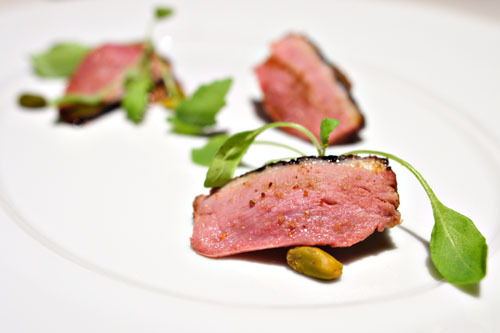 Muscovy duck came perfectly cooked, with an absolutely delectable savoriness. It played off the sweetness of the balsamic-peach combo, but I would've liked a bit less sugariness there. Fortunately, the toasted pepitas added a smoky, nutty saltiness to the dish that helped balance and tie everything together. 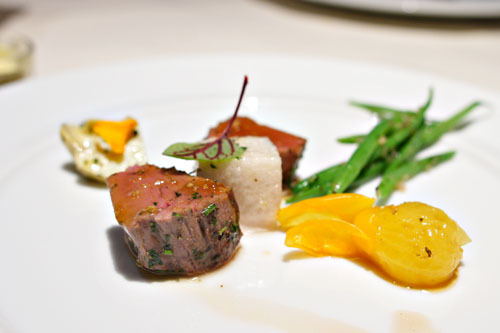 Our last savory course of the meal gave us a filet of Eel River beef, done up in the style of a Niçoise salad. The meat itself was nicely tender, with a great pepperiness, and went swimmingly with the subtle tanginess of the olive. I also appreciated the herbaceous smack of the tarragon, as well as the light, bright essence of the green beans and artichoke. 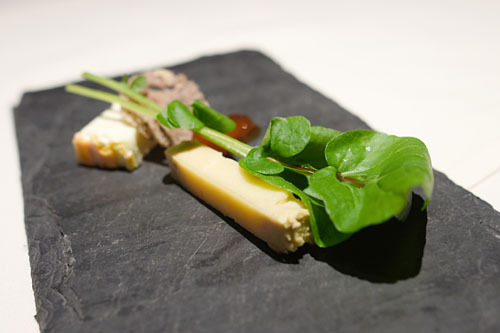 A duet of French fromage was next, served with peach preserves, walnut bread, and watercress. Gourgandine was a semi-soft cheese, with a funky, somewhat sweet, and almost blue-like character. I preferred the Brebirousse d'Argental, a soft cheese from the Auvergne region with a lusciously creamy character and a lovely lactic tang. Serving as a sort of pre-dessert was a slice of white nectarine doused with port syrup. I really liked the over sugariness of the port, and how it augmented the natural sweetness of the nectarine. A great, herb-y finish here too. 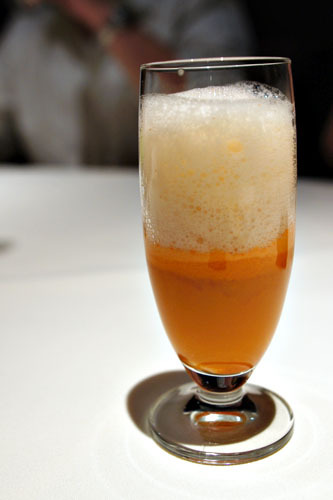 To pair with our desserts: a plum soda topped with peach ice cream. 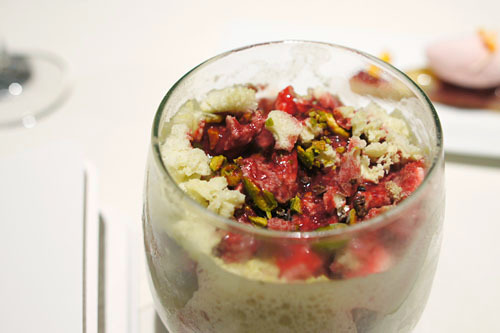 Here was Pastry Chef Ryan Shelton's take on spumoni, an Italian dessert of ice cream mixed with fruit and nuts. It was delicious, with a perfectly light, airy interplay between chocolate, pistachio, and sour cherry coulis. Very nice. 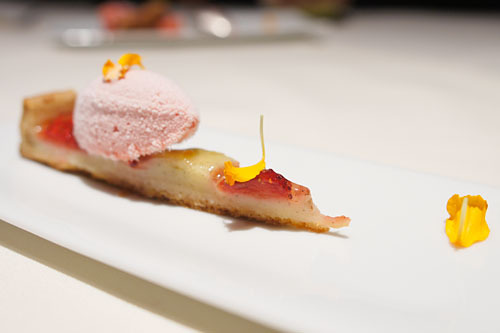 Joining the spumoni was a strawberry tart with strawberry ice cream. 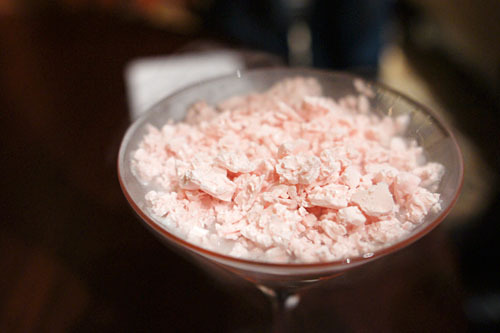 Here we had a very pure, focused berry flavor, with a nice mix of textures, all accented by a bit of floral flair. Rounding things out was a green tea-candied orange mochi, with the slight bitterness from the tea going well with the sweetness of the orange. 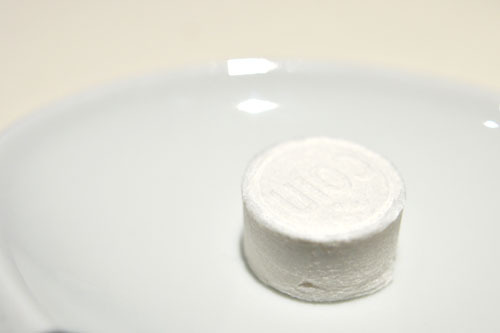 To take away: some delectable chocolate covered marshmallows. 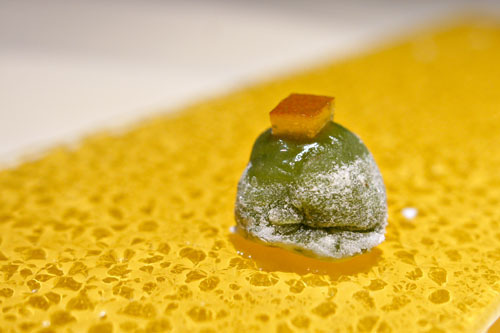 Regarding Baumé, someone once called it "a real throwback to when restaurants were embracing whiz-bang molecular gastronomy." Having dined there, I definitely understand where the commenter was coming from. 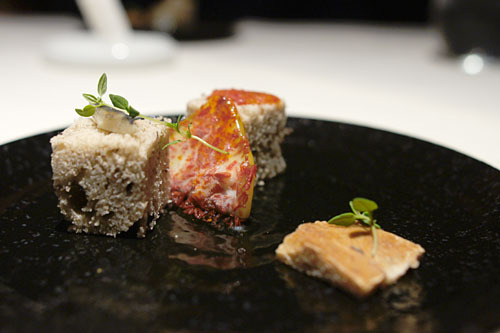 A lot of the dishes were whimsical, outlandish even, anachronistic perhaps, but such culinary fireworks didn't come at the expense of deliciousness for the most part. 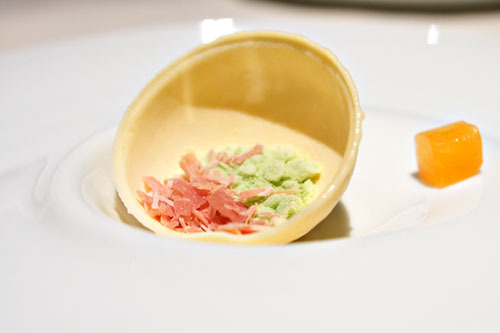 On one hand, I felt that some of the courses needed editing, but on the other, Chemel still respected the ingredients and their inherent character, and delivered food that incorporated avant garde cookery in an honest fashion.